The H530 Insert transforms an ordinary, heat-stealing open fireplace into a highly efficient, natural heating source that serves as an irresistible gathering place for family and friends. And since the H530 is EPA certified you can rest assured that your use of renewable wood fuel will burn cleanly and efficiently for years to come. The sophisticated new landscape shape measures 28” wide, 21” high, and 20” deep. It offers both radiant and natural convection heat -- something you cannot get with an open hearth, and it quickly cozies up the living space. It has a large full-sized fire box so there is plenty of room for standard length logs. 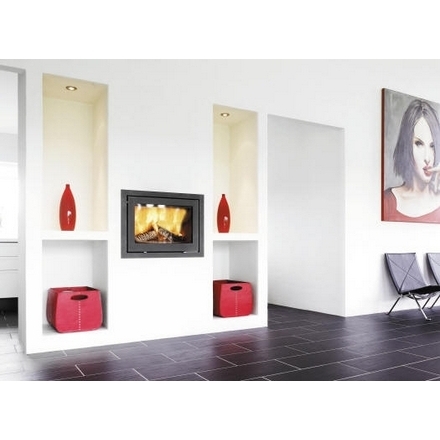 The H530 fireplace insert is easily installed in the open hearth and can be adapted to fit any existing space in the wall. There are optional matching steel surrounds available in a variety of sizes. The thermal “air wash” system constantly self-cleans the clear glass fire door to keep it practically sootfree. The recessed "cool" door handle is nearly invisible, yet it has finger tip control for ease of opening and closing. Higher fuel efficiency, higher combustion temperatures, and lower atmospheric emissions make burning wood a "green" thing and an enviromentally responsible addition to your home.